Some people can see things only in black and white, while others can appreciate the grays of life. To deal effectively with the people around you, you have to understand these personality traits. Gray people are the ones you can talk to, who can grasp complex and nuanced topics without getting upset. Black-and-white people are the ones you have to be careful of, because they maintain their simplistic positions only with a whole lot of messiness below the surface. Every cloud has a silver lining, and every "solution" to a personal or social problem can have negative consequences, sometimes worse than the original problem. For example, using modern medical care to save dying babies in Third World countries certainly sounds noble, but if it results in a population explosion that causes even more suffering in the long run, then it isn't necessarily "good". Black-and-white people understand only the simple one-dimensional outcome: saving babies right now. They don't understand the complex secondary effects: a destructive long-term population explosion. Grey people are willing to entertain these contrarian effects and absorb them into their decision making. There are still good decisions and bad ones, but the good decisions come about by weighing the good and bad potentials and coming up with a balanced solution. Human decision making isn't a black-and-white process, but a game of probabilities where you try to stack the odds in your favor. Gray makes perfect sense, but in real life most people gravitate to extremes. For example, they label themselves as "liberal" or "conservative" (Democrat or Republican in America) without considering the flaws of each position. Black and white people are those who hold fast to one simplistic position and can't consider any other. This isn't just about politics but about personal life choices. Black-and-white people can see only one correct answer, which usually coincides with whatever they have already invested in. Their religion, their career, their lifestyle choice happens to be the best in the world, and you can't even suggest that another option might have its benefits. If you attempt to discuss alternative options with them, their response is universal: They get angry. They cut you off. They make sure, one way or another, that they don't have to hear your message. If a black-and-white person has invested in something and you suggest an alternative worldview, they might politely tolerate your opinion for a few minutes, but when you start cutting close to the bone, the Rage Monster steps in. The rage might not be openly expressed, but one way or another, they're going to cut you off. They're going to kill the messenger. The majority of the people you encounter are black-and-white. They have made their investments, and you know instinctively that you can't seriously discuss these investments with them. You know it is futile to get in a serious argument with either a Democrat or a Republican, or to suggest to an engaged person that marriage might not be the best option, or to point out the logical flaws in someone's religion, or to question their obsessive and time-consuming hobby. If you do, you'll soon hit a wall where your logic has no effect. More importantly, your relationship with them will probably become unpleasant as they attack you for even suggesting such an idea. We all have unwritten rules about not challenging other people's investments. If we see that someone has made a mistake with their life, we're probably not going to say anything because we know it would only hurt them or make them angry. You know it's not going to achieve any real change, only damage the working relationship between you. Gray people are those who can calmly consider views that conflict with their own investments. These people are usually a joy to get along with, but they are also extremely rare. You have to have a lot of inner self-confidence to consider the possibility of your own error, and this doesn't come cheap. The ability to see gray is the product of plenty of past personal failure where the black-and-white solutions lead to disaster. Black-and-white comes naturally to any teenager, but gray is hard-won over time. It takes strength to see the other side of the coin, and most people just don't have it. Black-and-white people are generally hell to live with because they are a mess of contradictions inside. They maintain their monolithic position by simply not thinking very deeply about their choices. If life forces them to think, or you push your own argument too far, then the Rage Monster steps in, and if you happen to be available, you are likely to become the target of that rage. Anger is the universal censor. It assures that the message you most need to hear doesn't get through. All you need to do is trump up some thin justification for being angry at someone and then you can dismiss the whole rest of their message. "Black-and-white" is an ingrained personality trait that presents itself in a variety of circumstances. You can judge it by how quickly someone gets angry or otherwise cuts off the message when presented with opposing information. If someone is black-and-white is one situation, you can expect it in other circumstances as well. You know you're going to have to curb your tongue to avoid upsetting them. To avoid provoking the Rage Monster, you have to censor your own message before it gets to them. Gray people are different. They are open to opposition and aren't upset by it. This can happen only when the person is highly confident of his position and has already tested all the opposing viewpoints himself. The grey person does think deeply about things. You can't upset him with your words because he has already thought through all the possibilities. While the black-and-white people are a mess of contradictions below the surface, the grey person has an inner life of broad consistency. Because he has spent a lot of time carefully building the infrastructure of his belief system, he wastes a lot less energy defending it. Tell him he's wrong and give him a chance to respond, and he'll calmly show you how he is right ...assuming, of course, you are willing to hear. 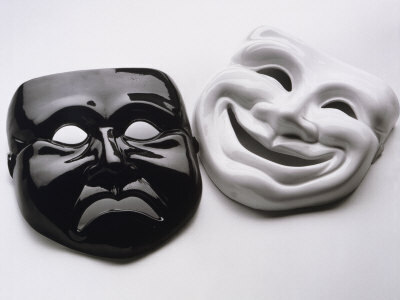 So which personality are you: black-and-white or gray? How much opposition are you really willing to accept to your most entrenched investments? If someone uses words to challenge everything you believe in, are you going to hear them out or cut them off? Gray people are rare and should be cherished, but you are not going to be able to tolerate them unless you are gray yourself. Otherwise, they just seem upsetting, often saying the wrong thing and triggering your rage. It's not easy being gray. The black-and-white people see you as some kind of freak. What do you mean you're not Democrat or Republican? Not Christian or Muslim or Atheist? The black-and-whites can't see the in-between, so you just have to tiptoe around them so your ambiguity doesn't upset them. To post on Twitter, retweet this.